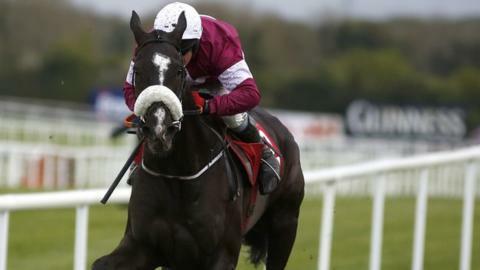 Pre-race favourite Don Cossack secured a convincing victory in the Grade One JNwine.com Champion Chase on the second day of the Northern Ireland Festival of Racing at Down Royal. Trained by Gordon Elliott and ridden by Bryan Cooper, the 2-11 favourite made it two wins from two for this season. Rocky Creek (7-1), runner-up to Road to Riches last year, was second of the four runners, with Roi du Mee third. Texas Jack was fourth in the three-mile race, worth 140,000 euros. Gold Cup contender Don Cossack added another Grade One to his increasingly impressive CV with a typically commanding performance. Cooper's mount glided into the lead four fences from home, after Rocky Creek and Roi Du Mee had jousted for the lead for a long way, and the race was essentially over. Don Cossack's winning margin ended up as eight lengths from Rocky Creek and Elliott is now targeting the King George VI Chase at Kempton on Boxing Day. "He was a little lazy and wasn't really in love with the ground, but I was always confident. He keeps stepping up," said winning jockey Cooper.